MADRID, SPAIN - July 14, 2011 - The Immersive Education Initiative today issued an open call for the first European Immersive Education Summit (iED Summit). Universidad Carlos III de Madrid will host the two-day iED Summit from 28th to 29th November 2011 in Madrid, Spain. The European Immersive Education Summit is organized by the newly formed European Chapter of the Immersive Education Initiative (iED Europe) and builds on the success of previous iED Summits. The European iED Summit call for papers, posters, and presentations is open to the global academic community and experts in immersion, virtual reality and mixed/augmented reality. Speakers at past iED Summits have included faculty, researchers, and administrators from The Grid Institute, Boston College, Harvard University (Harvard Graduate School of Education, Berkman Center for Internet and Society at Harvard Law School, and Harvard Kennedy School of Government), Massachusetts Institute of Technology (MIT), MIT Media Lab, The Smithsonian Institution, Loyola Marymount University, Stanford University, United States Department of Education, National Aeronautics and Space Administration (NASA), Federation of American Scientists (FAS), Duke University, Temple University, Southeast Kansas Education Service Center, Immersive Education High School, Cornell University, Amherst College, Kauffman Foundation, Boston Library Consortium, Montana State University, South Park Elementary School, Boston Media High School, Sun Microsystems, Turner Broadcasting, Open Wonderland Foundation, realXtend (Finland), The MOFET Institute (Israel), University of Aizu (Japan), Keio University (Japan), National University of Singapore, Royal Institute of Technology (Sweden), University of Essex (UK), Coventry University (UK), Giunti Labs (Italy) and European Learning Industry Group, Open University (UK), and more. 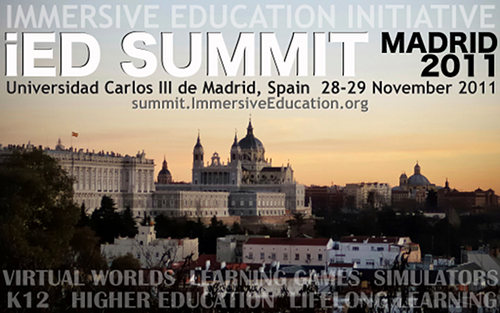 The world's leading experts in virtual worlds, learning games, educational simulations, and mixed/augmented reality convene November 28-29 in Madrid, Spain, for the first annual European Immersive Education Summit.